As the cryptoasset markets develop we’ll see many booms and busts as enthusiasm waxes and wanes. Waxing and waning is all part of riding a rocket to the moon. Bitcoin has been through a few boom-bust cycles already, most notably the waxing enthusiasm leading into late 2013, when bitcoin first broke $1,000, followed by the painful waning that lasted until January 2015 and bitcoin’s bottom at $175. With bitcoin now pushing towards $4,000, up nearly 4x in 2017 alone, we are once again in a period of waxing enthusiasm. For the cryptoassets that have actual utility value, this waxing and waning pattern will create a price chart that resembles a familiar pattern: the J-curve. In private equity, the J-curve refers to a portfolio’s cash flows, while in economics it is commonly used to describe the effects of currency devaluation on the national deficit. In crypto, a new J-curve is born. The basic idea of a crypto J-curve stems from how the market values a cryptoasset over time. 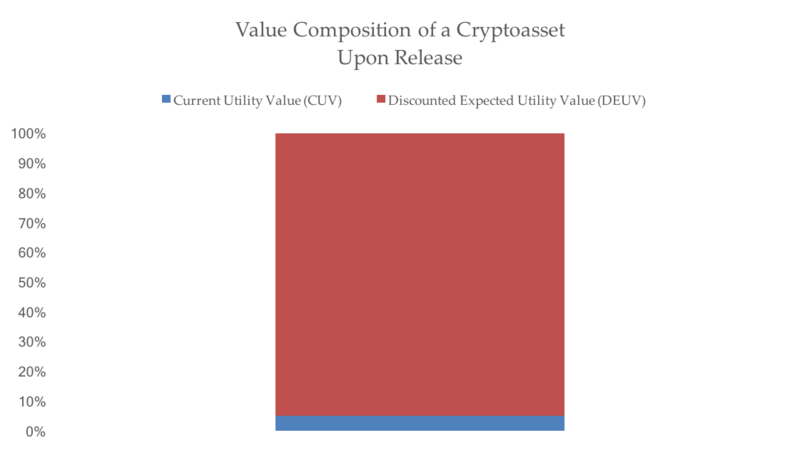 As I explained at the Token Summit, I think of a cryptoasset’s price as composed of two forms of value: “current utility value” (CUV) and “discounted expected utility value (DEUV),” the latter of which some prefer to call speculative value. (Sidenote: the term speculative value can only be used pejoratively if one also acknowledges the pricing of most all high growth equities is largely composed of “speculative value” around future cash flows). Upon trading, enthusiasm for a cryptoasset is high, and typically continues to wax for a while. In this period, the CUV of the asset is minimal, or non-existent if there’s no protocol. The asset is then largely composed of DEUV, and thereby exposed to the whims of Mr. Market. This initial period of high enthusiasm is the first (mini) peak of a crypto J-curve, as shown below. Note that in the above image, “High % DEUV, low % CUV” refers to the percent composition of the price, not an absolute value. From my work valuing different cryptoassets, it’s not uncommon for the value composition to look something like the below during early days. Initially inflated price, initially inflated DEUV. Explain it however you like, when the times get tough speculators bolt for the exit, the DEUV gets squashed, and with little current utility value, the price of the token gets crushed. Ask any bitcoiner about 2014 — it wasn’t a fun year. However, a dedicated developer team will keep their head down and remain indifferent to the whims of Mr. Market. As a result the protocol improves and more users (not speculators) trickle in. With increased use, the CUV of the cryptoasset grows quietly. A growing CUV can occur even as the DEUV of the token continues to compress. 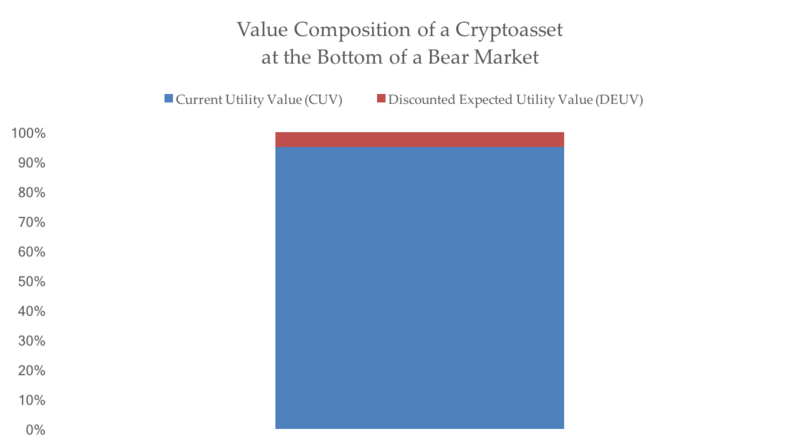 If the market is bearish enough, the price of the asset may compress DEUV all the way to zero, leaving only CUV, and a drastically diminished price. Potentially, the market may even discount the asset to the point of trading below CUV, somewhat akin to a stock trading beneath book value. Often, however, beyond the developers, users, and broader “utility community,” a die-hard group of investors hangs on, representing a sliver of the DEUV that once was (shown below). I believe this is what happened to bitcoin through the first three quarters of 2015, as it based in the low $200’s. This is the bottom of the crypto J-curve. The ascent from the bottom of a J-curve can be a slow one, hence the drawn-out upslope. The curve will start to steepen as Mr. Market awakes to the growing CUV of the asset, injecting more DEUV back into the price. Such a process is the reverse of the above three bullets, as perhaps the discount rate lowers, the expected penetration of the target market widens, or optimism around the total addressable market grows. 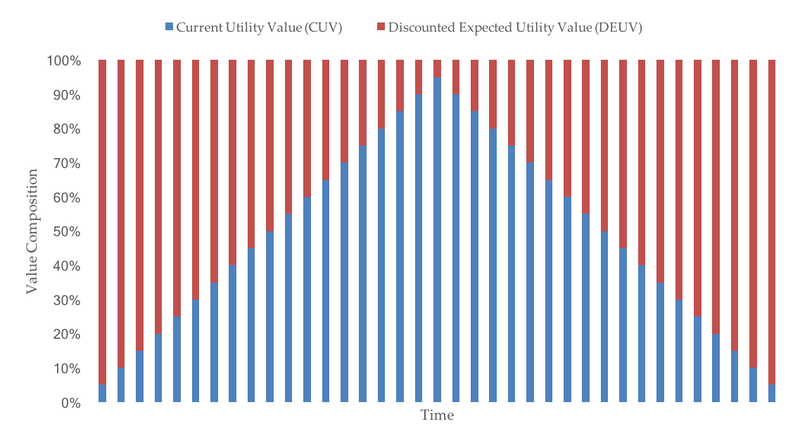 However you slice it, the DEUV expands as expectations around future utility value grow based upon the growth in CUV. Shown below is how this played out for bitcoin from the start of 2013 to present. The velocity of what happens next varies widely. Ideally, CUV and DEUV will expand in tandem, finding a healthy equilibrium. In strong bull markets, however, often DEUV will start to quickly outpace the growth of CUV. Speculators start to pour back in, expanding the DEUV at an accelerating rate, and divorcing financials from reality. This is why a crypto J-curve typically steepens in its later stages. At this point, a full cycle has played out. 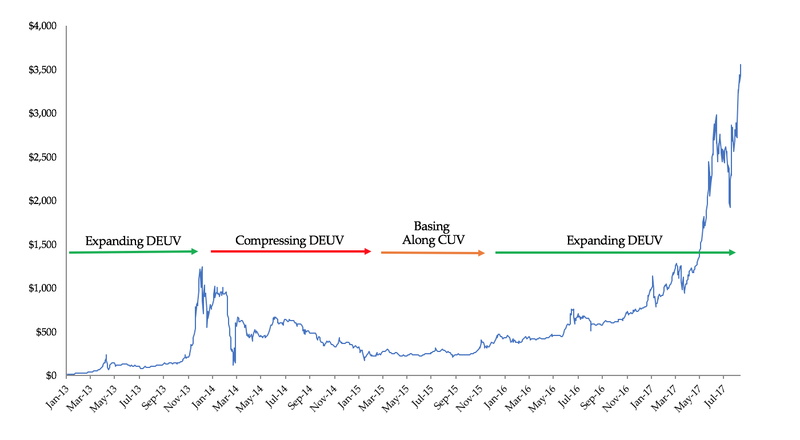 A cryptoasset has gone from being primarily composed of DEUV upon release, falling to the depths of a bear market and basing along CUV support, before once again expanding to be majority composed of DEUV. The percent composition of a cryptoasset’s price during this period is shown below. 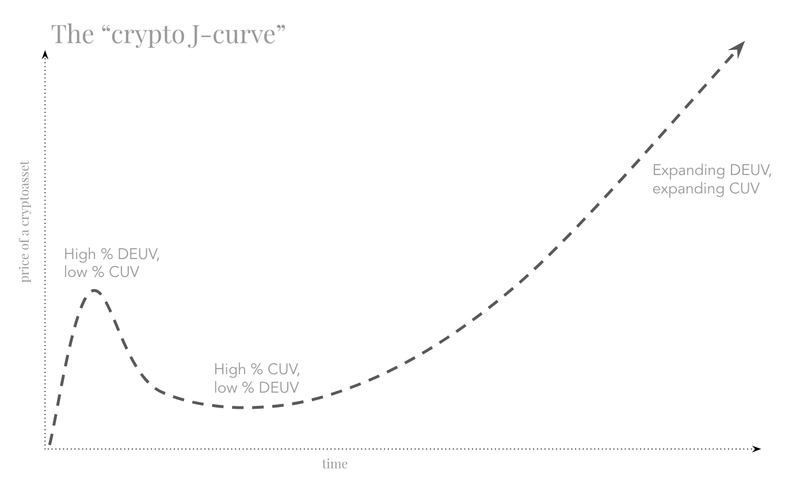 The J-curve is a price manifestation of the above shifts in market sentiment and utility value. When expectations are initially high, so too is the price, but often largely composed of DEUV. As expectations wane, so too does the price, even if CUV grows. Ultimately, as DEUV expands once again, the price of the asset should exceed its prior high as it is supported by more CUV. Put another way, with a higher current utility value, the amplification of discounted expected utility value can be greater. Expect some fierce bull markets in the years to come. Then, the cycle will play out again… and again… and again. In macro-patterns and micro-patterns I expect many J-curves to play out, the difference is one of time scale. By macro-pattern I refer to a decadal time-scale. Each prior peak of DEUV will pale in comparison to the following peak in DEUV, creating an ever refreshing J-curve. That J-curve will be composed of many micro J-curves, the periodicity of which is still being determined. Ultimately, at steady-state, a cryptoasset should be mostly composed of CUV, with a tad of speculation happening at the margin. At this point, the multi-decadal J-curve should start to taper, ultimately resembling an S-curve as the years of utility roll on. The amount of continued speculation around future utility will depend on how much of the target market has already been captured, and how much the protocol has ossified. Of course, this is all theory, so don’t expect perfect patterns in reality. But so long as utility waxes over the long-run, we’ll make it to the (full) moon. Thanks to Joel Monegro, Cathie Wood, Brett Winton, and Stephen McKeon for helping me think through different aspects of the crypto J-curve.